Oncology is the branch of medicine that deals with the diagnosis and treatment (or management) of cancer. As veterinary medicine progresses over time, our pets are becoming more and more a part of our families and are leading longer lives. With increasing age comes the elevated risk of developing cancer. Unfortunately, one quarter of pets will lose their lives each year to cancerous conditions. 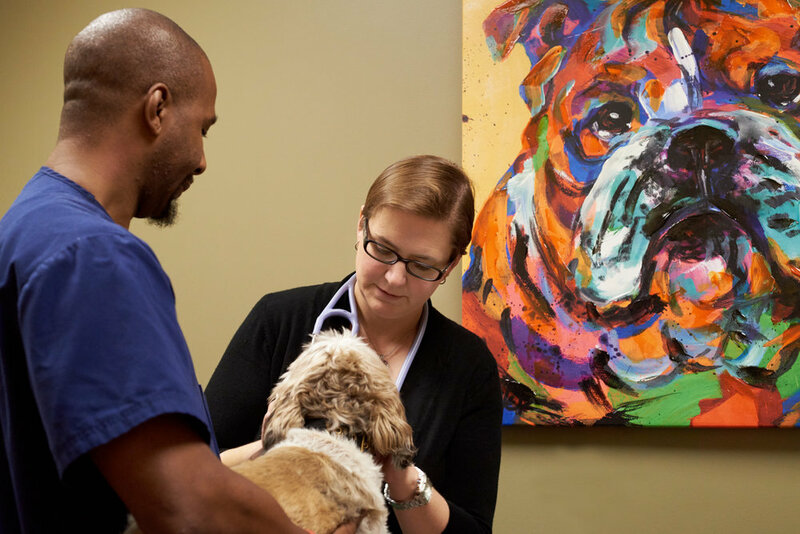 Your family veterinarian is the first line of defense for an early diagnosis of cancer, which will give your pet the best possible chance for a positive outcome. If your veterinarian is concerned that your pet may have cancer, you may be referred to the Oncology department for further workup and treatment. The first step is diagnosis of the type of cancer, which will determine prognosis and treatment options. The next step is to determine if the cancer has spread (metastasized) beyond the local site; this is done via “staging”, which usually will include labwork and imaging (xrays, ultrasound, CT, MRI). From there, a treatment plan will be discussed and started. While the underlying biology of cancer is very similar in pets and humans, the experience of treatment is very different. Dogs and cats do much better with chemotherapy and radiation than people do. General side effects (vomiting, diarrhea, lethargy, poor appetite) happen in less than 25% of patients and are usually mild and easily managed. Thankfully, fur grows differently than human hair so your pet will not lose their fur! Our goal at TVRH is twofold: to keep your loved one feeling amazing, while prolonging their life as much as possible. Veterinary Oncology is divided into two sections: medical oncology and radiation oncology. Medical oncology deals with the use of drugs (chemotherapy) to fight cancer while radiation oncology uses high powered radiation/energy to kill cancer cells. There are many factors that will determine the best treatment option or combination for each individual patient. The most important thing is for you to obtain all the information needed to make a decision regarding treatment. There is no one “correct” pathway for any disease process. Treatment protocols can range from aggressive pursuit of long term control to palliative/hospice care focusing purely on quality of life.